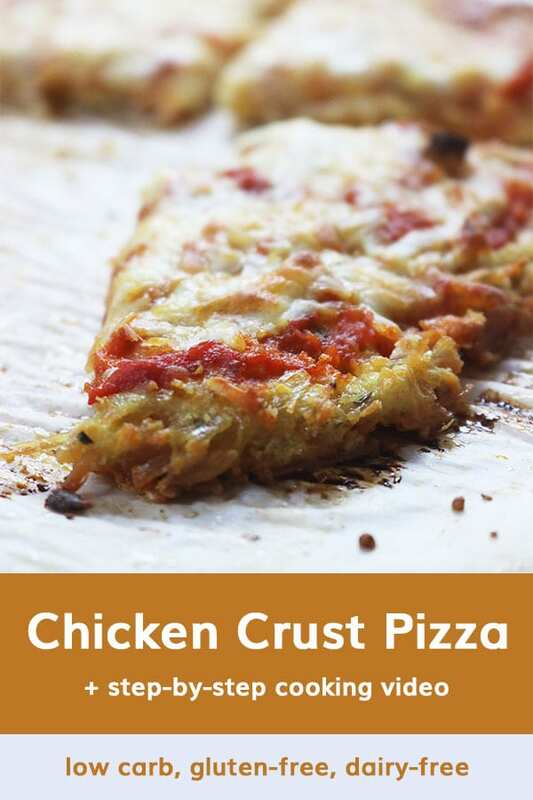 My chicken crust pizza recipe is an absolute staple of mine for when I’m in the mood for comfort food. This low carb pizza crust is versatile, crispy, and very simple — all it takes is about 15 minutes of prep work. 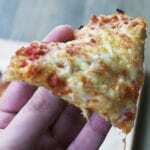 Now, I know there are many great keto pizza recipes out there. I mean, have you tried the Fathead Pizza Crust? However, I notice that a lot of them are very heavy on dairy. I take no shame in admitting my love for cheese, but sometimes it’s just a little much. My chicken crust pizza is the perfect alternative. This pizza crust recipe is also: dairy-free, gluten-free, nut-free, and even paleo! I typically bake my crust on a parchment-lined cookie sheet. Use what you have access to. I’m sure a pizza pan or stone would work great, too! Cheap. You can keep a small stockpile of canned chicken on hand for a quick and delicious dinner at any time. Filling. It’s full of protein and it tastes great. What’s not to like? Tender. The chicken is surprisingly tender from the can. My low carb chicken crust pizza is super versatile and acts as a great base for all of your favorite toppings. It is without a doubt one of my favorite keto recipes. If you’re unable to find or use pork rinds (or you may see them labeled as chiccarone), you can substitute a half cup of Parmesan cheese. This will make a very crispy crust. Prepared or ground chicken (including chicken thighs) can also be used, but the cooking times and textures will vary. Ground turkey could work, too. For a smoother dough, combine all ingredients in a food processor and pulse it until it you get your desired consistency. Yep, these freeze great, too! After preparing, let the chicken crust come to room temperature and then double wrap in plastic wrap + foil. As far as how long these will store, I’m not entirely sure. I’ve always used mine within a month, so your mileage may vary. This is a great time-saving recipe that can be made quickly if prepared in advance. All it takes is a little prep work and a series of quick bakes for about 20 minutes. The possibilities are endless. Add additional seasonings to the mix and try different flavors. A quick video showing you the steps to making your own chicken crust pizza. Follow these steps and you’ll be making them in your sleep! Do be mindful – this recipe is for one personal pizza. If you are cooking for more people, be sure to take note of the ingredients needed. A low carb chicken crust pizza that is crispy, filling and super simple! Open and drain the canned chicken. Using two forks, break chicken into smaller pieces. On a cookie sheet lined with parchment paper, spread the chicken into a single layer and pop into the preheated oven. Place chicken into mixing bowl with the rest of the ingredients. Mix until it is well incorporated. 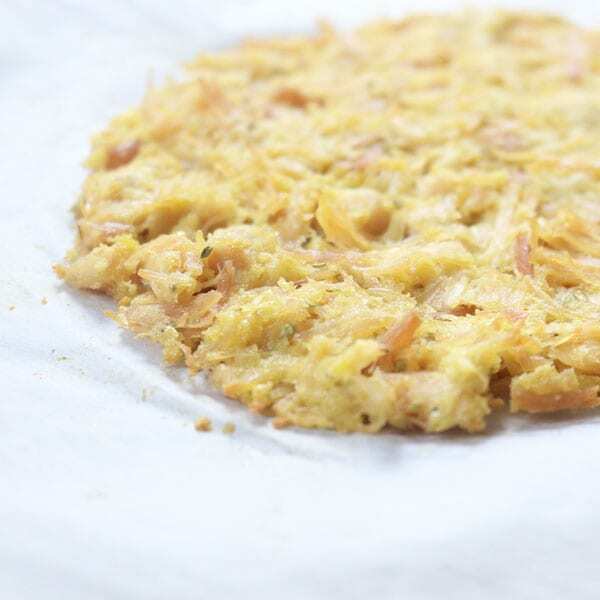 Dump the contents of the chicken mixture onto a parchment-lined cookie sheet. Form pizza crust into the shape you desire. Bake the crust for an additional 5 minutes. Remove crust from oven and add your favorite toppings. Place back in the oven for roughly 10 minutes or until all toppings are heated through and/or melted. Don’t feel like cooking but still want chicken pizza? Check your freezer section for products from Real Good Foods — they’re yummy! What toppings would you put on your chicken crust pizza? Comment below! Even easier is to put a piece of boneless chicken flat (eg. breast or thigh) in a ziplock bag and pound until really flat. Top with pesto or tomato-based sauce, then toppings, then bake. You’ll need a fork and knife to eat it, though! I have always used ground chicken for my crust but I am going to give this a try. I like that it makes a single service pizza, which I could also freeze and reheat. Ground should work too! It will just be a different texture than the canned.